G.J.C. 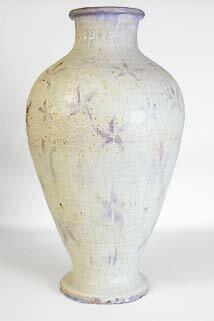 vase - 16¾" (425 mm) high. This beautiful vase looks very like the work of George James Cox, and the signature says G.J.C. too, but it's wrong. The mark doesn't look like any of the George James Cox marks that we have found - Cox usually put the 'J' the wrong way round. Now - if someone with sufficient skill to copy Cox's work wanted to pass his/her own work off as Cox's, why wouldn't they copy the signature too? We are hoping that someone reading this will know something that we don't. If that's you, please, please contact us by clicking on the link below, and we can share your knowledge with the world!